Isavuconazole is a potent triazole; like Voriconazole, it has garnered an indication for invasive aspergillosis. 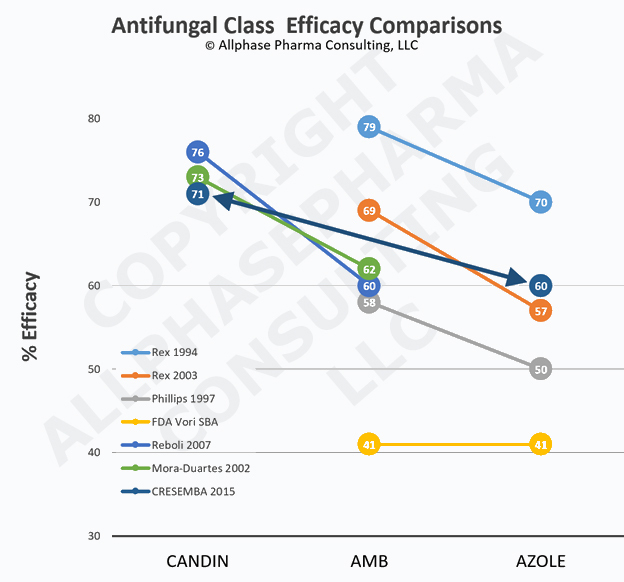 However, it failed where other azole antifungals succeeded: in a pivotal trial, not yet published, the drug was inferior to Caspofungin in the treatment of invasive candidiasis/candidemia in non-neutropenic patients . To provide some background: in a series of candidemia studies, Fluconazole IV/PO was shown to be non-inferior to Amphotericin B (AmB) ,,. In addition, Pfizer Study 150-108 proved that Voriconazole IV/PO was as efficacious as AmB followed by Fluconazole PO. So it stands to reason that Isavuconazole would also do well in candidemia too, right? Fluconazole just barely achieved non-inferiority to AmB in several studies, it was clearly inferior in some subset analyses. In every study, even with the high dose 800 mg loading/400 mg maintenance regimen, Fluconazole was numerically inferior (see Figure below). Resistance to azoles has crept up over time in various Candida sp., which would impact Isavuconazole more than AmB. Given this data situation we deduce that Isavuconazole would do better in invasive candidiasis/candidemia if the comparator were an azole instead of AmB. Either Fluconazole or Voriconazole could serve as comparator drugs, but Voriconazole would be preferred for commercial reasons. doable, but risky as explained above. best chance for Isavuconazole to score a home run, but need to select non-neutropenic patients and try to imitate populations from prior azole trials. Is there / was there ever a rationale for a 3rd option in which Isavuconazole would go head-to-head against a candin? Three large well-controlled trials were conducted in the past comparing a candin with either AmB or Fluconazole ,,. In each case, therapy with the candin resulted in numerically superior efficacy, sometimes to the point of statistical superiority. Now let’s put all the pieces together: If an azole can barely match the efficacy of AmB, and AmB is less efficacious than a candin, most folks would predict that Isavuconazole will not do well against a candin. In addition, Isavuconazole has the disadvantage of being ‘only’ fungistatic while the candins can claim rapid fungicidal activity. Basilea has not enlightened us to why they chose Caspofungin as the comparator in a pivotal trial. If there were good reasons to think that Isavuconazole had greater intrinsic potency than other azoles, we would like to learn about them. Looking at the situation as an impartial outsider, this trial was ill-conceived and became a debacle, quite avoidable, you might say. It was a poor study design, not lack of antifungal activity which derailed this candidemia study. Going for Option #3 seems like a choice based on delusions of grandeur. But some folks like to bet against the bank, let’s presume. At the Basel casino, the roulette players,“rien ne va plus,” would certainly give Isavuconazole a 1:20 chance of meeting NI goals against a candin, knowing that a study with an alpha of 0.05 has a 5% probability of failing to refute the null hypothesis. This entry was posted in QIDP Antibiotics, The News, The Viewpoint and tagged Allphase Pharma Consulting, AmB, anidulafungin, antibiotic blog, aspergillosis, Astellas, Basilea, Cancidas, Candidemia, caspofungin, Cresemba, Diflucan, echinocandin, Eraxis, failed pivotal trial, FDA, fluconazole, fungicidal, fungistatic, Harald Reinhart, invasive candidiasis, isavuconazole, Merck, micafungin, Mycamine, non-inferiority, Pfizer, SBA, triazole, Vfend, Voriconazole by Harald. Bookmark the permalink.